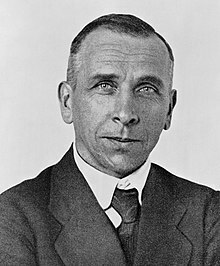 Idea was first proposed by Alfred Lothar Wegener (1 November 1880 – November 1930), a German scientist, who's idea of Continental Drift was controversial and wasn't widely-accepted. His hypothesis that the continents are slowly drifting around the Earth (German (de): Kontinentalverschiebung) went largely ignored. However, it became widely accepted in the 1950s, when several discoveries proved right of Alfred's theory, including palaeomagnetism. Fossil evidence - Fossils of extinct animals have been found in specific places on continents. Seafloor spreading (More: http://wiki.kidzsearch.com/wiki/Seafloor_spreading) - New crust is forming at mid-ocean ridges where tectonic plates are moving away from each other... Scientist Harry Hammond Hess, an American geologist (and former Navy officer), discovered Seafloor Spreading. Magnetic reversals (More: http://kids.britannica.com/comptons/art-194471/Rising-magma-assumes-the-polarity-of-Earths-geomagnetic-field-before) - Minerals in rocks align to the magnetic field of the earth. As the seafloor spreads, we see the history of the reversal of the magnetic fields. Seafloor Spreading is the process when new oceanic lithosphere forms due to the rising and solidifying of magma. As tectonic plates move away from each other, new crust (magma, then solidified) fills in the gap between the moving sea floors. This new crust forms underwater mountain systems called mid-ocean ridges. The new crust pushes away the older crust, thus, the closer to the mid-ocean ridge, the younger the crust is. Magnetic Reversals are defined as: "A change in the Earth's magnetic field (the North Pole --> South Pole, and vice versa)". This page was last edited on 18 November 2018, at 16:36.